A number of men and women have, in some particular way, shaped the life of the Church in Canada. Some gave their lives to ensure that the Good News be heard throughout North America. Others, out of steadfast faith and profound love dedicated their lives to the service of their brothers and sisters, whom very often were among the most underprivileged. Declared saint, blessed or venerable by the Popes over the years, these extraordinary people are lights on the journey and examples of holiness and charity that Catholics can follow. The North American Martyrs were a group of six Jesuit priests and two associates who worked selflessly as missionaries to the Hurons in the colonial days of New France. Having been martyred for their faith, they were canonized by Pope Pius XI on June 29, 1930. 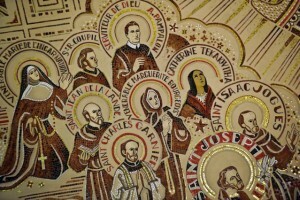 Their feast day is celebrated in Canada on September 26. Marguerite Bourgeoys established the first school in Ville-Marie (present-day Montreal) and founded the Congregation of Notre Dame, an order of religious women, largely responsible for bringing Christian education to many areas of the New World. She worked tirelessly to ensure the rights and welfare of women and children in New France and to guarantee that young people received an education. Canonized by Pope John Paul II on October 31, 1982, her feast day is celebrated in Canada on January 12. Marguerite d’Youville was instrumental in setting up hospitals in Montreal with the help of the Grey Nuns (Sisters of Charity), an order of religious women that she founded. She played a special role in caring for the poor, the elderly, orphans, invalids and the mentally challenged. Her congregation spread across Canada, setting up hospitals. Canonized by Pope John Paul II on December 9, 1990, her feast day is celebrated in Canada on October 16.